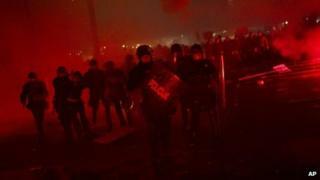 Protesters have clashed with riot police in Slovenia's capital Ljubljana during a rally against budget cuts and alleged corruption. Some demonstrators threw stones and bottles, and tried to push through a police cordon outside the parliament. The police responded by firing tear gas. A number of protesters were held. Slovenia is facing one of the worst recessions among the 17 countries in the eurozone - the country's economy has shrunk more than 8% since 2009. On Friday, at least 5,000 anti-government protesters in Ljubljana rallied outside the parliament building. Many chanted "You are finished!" and "Thieves!" Police officials said a group of protesters then tried to break through the cordon, forcing the police to respond. At least 10 police officers were injured, spokesman Vinko Stojnsek told the AFP news agency. The rally took place two days ahead of a presidential run-off between incumbent Danilo Turk and former Prime Minister Borut Pahor. Many protesters were angry over what they described as harsh austerity measures being implemented by the current centre-right government. The also accused the government of corruption - a claim denied by the authorities.